A company engaged in hydraulically moulding thermosetting plastic components used a compressed air gun to clear flash and powder deposits from the die moulds. Before it was redesigned, the gun consisted of a plain steel tube, with an internal diameter of approximately 1/8 in, screwed into the end of a compressed air hose and directed at the appropriate area. The interaction of the high-velocity jet and the surface of the moulds produced A-weighted noise levels reaching 105 dB. The plain nozzle was replaced by one generating an induced secondary air flow through an aspirated venturi. 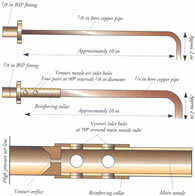 The primary flow was passed through a venturi nozzle inside a tube, drilled in its sides to allow outside, secondary air to pass through the wall and mix with the primary jet at the venturi discharge. 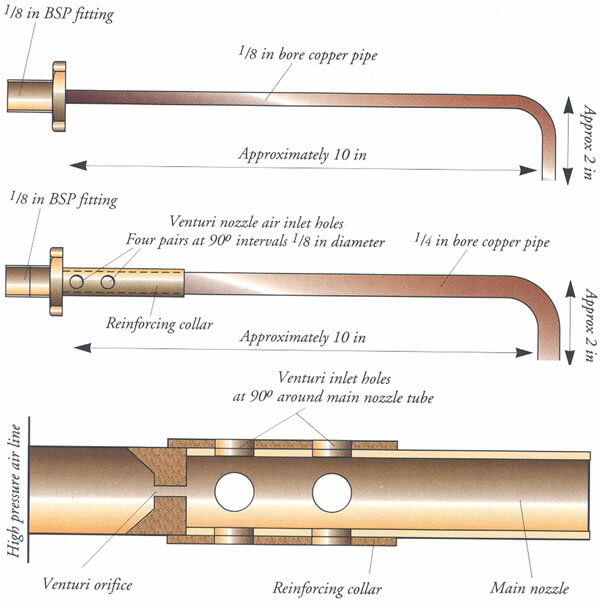 The effect was two-fold: the mix of primary and secondary flows within the tube reduced the amount of turbulence and hence the sound generated at the primary nozzle; the larger diameter of the tube itself reduced air speed onto the mould dies, even allowing for the increased volume of the discharge air, and hence reduced noise generation at the die mould surfaces. A noise reduction of up to 10 dB. Another benefit was increased mechanical strength of the tube which allowed the occasional flash or powder deposit on the die to be removed by tapping or scraping with the tube edge. Information supplied by Industrial Noise Services Limited.